The National Assembly approved a revised bill on the government's 2019 budget Saturday as minor parties boycotted the vote amid a row over electoral reform. 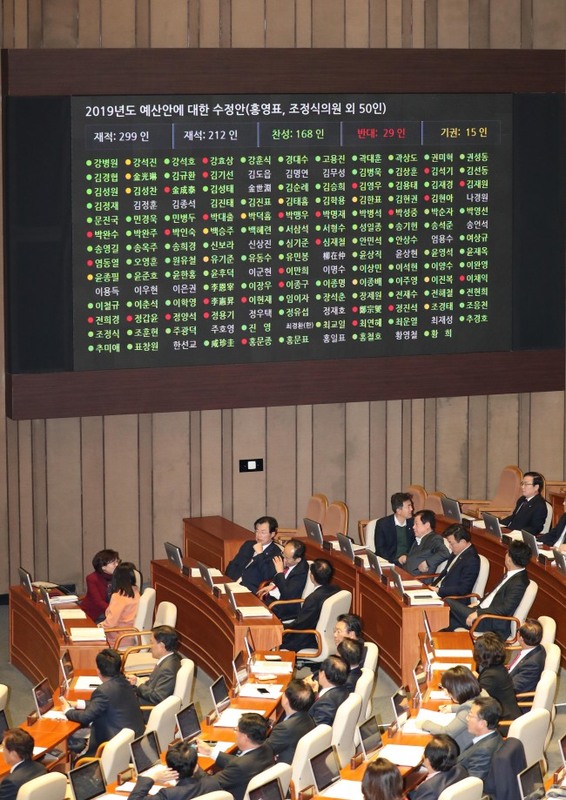 Parliament passed the 469.6 trillion-won budget bill in a 168-29 vote, with 15 abstentions, down a net 927 billion won from the government's original 470.5 trillion-won budget proposal. A record budget plan is aimed at boosting the slowing economy and spurring job creation, as well as backing up inter-Korean projects. The ruling Democratic Party (DP) and the main opposition Liberty Korea Party (LKP) on Thursday reached a tentative budget deal that includes a cut in spending on job creation and inter-Korean projects by some 5.2 trillion won. But the agreement did not include a commitment to electoral reform, a key sticking point in the budget negotiations, drawing condemnation from minor parties. The minor opposition Bareunmirae Party (BP) and two minor parties sought to link the budget bill passage to the introduction of a new proportional representation system, a proposal rejected by the DP and the LKP. The three smaller parties boycotted a plenary session in protest of what they called bigger rivals' political collusion to defend their vested interests. Despite their objection, the budget proposal was passed in the National Assembly as the DP and the LKP have a combined 241 seats in the 299-member parliament. The smaller parties are pushing for the introduction of a mixed-member proportional (MMP) representation system in which parliamentary seats are tied to the percentage of voters' support for different parties. The ruling DP and the LKP remain lukewarm toward accepting the MMP system, while minor players seek to increase their presence in the National Assembly, which is dominated by the two major parties, with the proposed scheme. Sohn Hak-kyu, the chief of the BP, and Lee Jeong-mi, the chairwoman of the leftist Justice Party, started a hunger strike Thursday in protest. This year's budget review did not go smoothly amid partisan wrangling, with the legal deadline for its passage expiring last Sunday. Under Thursday's agreement, the two major parties agreed to cut some spending on job creation and inter-Korean cooperation projects and reduce the number of newly hired public servants by some 3,000. The parties, meanwhile, decided to increase spending on measures to tackle the low birthrate and ways to build social infrastructure, which amount to more than 4 trillion won combined. The government earlier said that it expects the shortfall in tax revenue due to a series of tax cuts, including a 1.1 trillion-won deficit resulting from a temporary reduction in fuel taxes. The budget deal called for the government to repay debt in advance this year to fill the expected 4 trillion-won shortfall. For next year, state bond sales will be limited to 1.8 trillion won. In 2014, the National Assembly barely made the legal deadline for the budget's passage but has failed to meet it every year since then.